Chanteur Country US né le 22 Octobre 1958 à Sweetwater (Tennessee). Singer/songwriter Butch Baker made his singing debut in his father's church when he was only 19 months old. He was born in Sweetwater, TN, and spent much of his childhood singing, influenced by Ray Charles, Elvis Presley, the Everly Brothers, Don Gibson and Red Foley, as well as gospel music. Following his graduation from Tennessee Military Institute at age 16, he became a drama major at the University of Tennessee. It was here that he eventually decided to pursue a music career. He moved to Nashville in 1979; to raise the bus fare for the trip he sold his beloved guitar. Once in Music City, he worked by day as a menswear salesman. At night he would frequently sit in with assorted bands and frequently played the Nashville Palace, where he was eventually hired for a nine-week gig. He founded SRB to be his back-up band. His success led him to record demos for such premiere songwriters as Jerry Foster and Bill Rice. This in turn led him to become a staff writer for Acuff-Rose, where he became a protégé of Wesley Rose. He signed to Mercury in 1984 and made his single debut with "Torture." His subsequent singles "Burn Georgia Burn" and "Thinking About Leaving" (both 1984) were minor hits, as were 1986's "That's What Her Memory Is For" and "Your Loving Side." He scored three more minor hits by 1988. Baker made a guest appearance along with several other up-and-coming singers on Hank Williams, Jr.'s song "Young Country," which appeared on his Born to Boogie album. Baker continued recording, but didn't make it to the Top 40 until 1990 when he and Daniele Alexander duoed on her song "It Wasn't You, It Wasn't Me." That year, he released his Harold Shedd-produced debut album We Will. He was later released from the label, and continued writing songs and appearing regularly on TNN's Morning Video show. 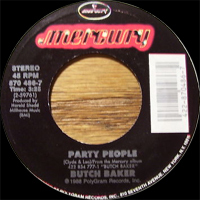 03/1984 SP MERCURY 818 759-7 (US) Torture / ? 03/1985 SP MERCURY 880 653-7 (US) The Lady Loves Her Job / ?